If you are going to have hemodialysis for management of your kidney failure, you will need one of three types of vascular access to make your dialysis possible: an arterio-venous (AV) fistula, an AV graft, or a venous catheter. All three provide the vascular access needed for your regularly scheduled dialysis sessions, but there are a few differences between them. You and your doctor will have to choose which is best for you. The relationship between kidney failure and vascular access is important. 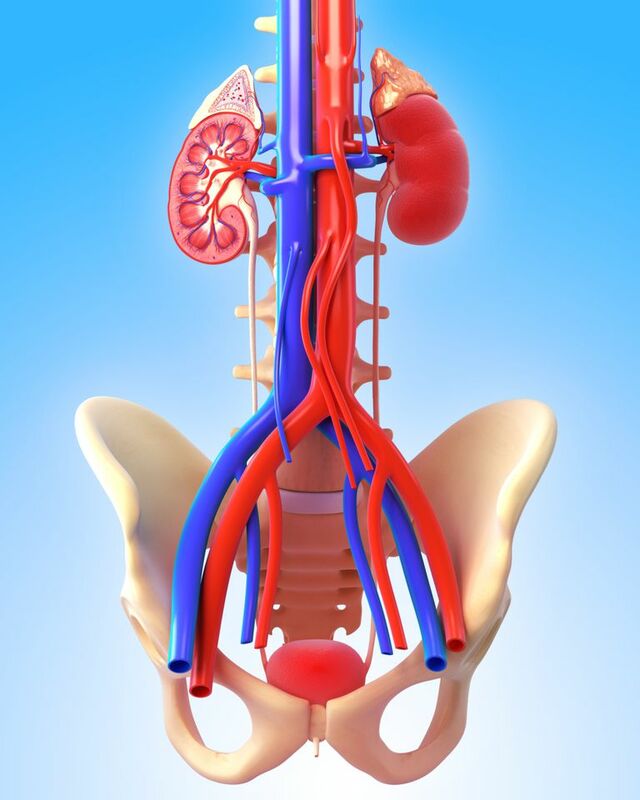 Your kidneys act as filters to remove toxins from your body and to adjust your fluid and nutrient concentration. They keep what you need in your blood while also producing urine, which contains the materials that you don't need. A person with no kidney function is unlikely to live beyond a couple of weeks without treatment. If your kidneys fail, then dialysis—the lifesaving method of cleaning your blood to rid your body of waste—is essential. Dialysis provides a "substitute kidney" to filter your blood and get rid of toxins. There are two different kinds of dialysis: hemodialysis and peritoneal dialysis. There are pros and cons to each, and you and your doctor can decide which type is best for you. Peritoneal dialysis is done using a catheter (tube) and a special fluid that is inserted into the abdomen to filter waste. Hemodialysis, the far more common type of dialysis in the United States, uses a machine to filter your blood. Hemodialysis is done via vascular access, which connects your blood vessels to the machine. Vascular access allows blood to be drawn from your body and directly channeled into a dialysis machine, where it's cleaned of toxins and excessive fluid. Vascular access then flows the filtered blood back into the body. All three types used for hemodialysis allow for this, but there are a few basic differences between them. The term arteriovenous refers to blood flowing from the artery to the vein. Arteries are blood vessels that carry oxygenated blood from the heart to different organs. Veins are the blood vessels that carry blood from which oxygen has been consumed back to the heart. Arteries and veins are not normally directly connected, because the blood travels from arteries through tiny capillary connections, and then moves on to travel within the veins. AV access is a surgically created, direct bridge between an artery and a vein that bypasses the capillaries. AV fistula: The bridge is formed using the body's own blood vessel. AV graft: The bridge is formed using an artificial material. An AV fistula is typically preferred over an AV graft because it usually lasts longer, functions better, and is less likely to become infected or clot. An AV fistula requires blood vessels that are in good shape. If you don't have open, smooth blood vessels, you may need an AV graft using an artificial material instead. An AV fistula and an AV graft are both formed by procedures that are done in the operating room or in a surgical suite. This is usually an outpatient procedure that lasts between one to two hours. They are typically done in your non-dominant arm (the arm you don't use to write). You will need local anesthesia or a nerve block to prevent pain. You might also need intravenous sedation, which can help you sleep or rest, but does not require respiratory support the way general anesthesia does. An artery and a vein are selected, transacted (cut) and surgically sewn to each other directly or using a graft. The connection between the artery and vein remains completely inside your body. Both of these procedures allow rapid flow of blood so that you can have all of your blood dialyzed within a relatively short period of time. This is made possible because the bridge between the artery and the vein results in widening of the vein, which is normally narrow compared to an artery. The wider vein may also make it easier for your nurse to place a needle for your dialysis if your veins are thin and difficult to access. Every time you go for your dialysis, you will have a needle inserted into the venous side of your AV fistula or graft to deliver blood to the machine, and another needle placed in the arterial side to deliver the filtered blood back to your body. Repeated blood clots may occur if you have severe vascular disease, a blood clotting disorder, or if you smoke. This can prevent blood flow through the graft or fistula, necessitating the use of a blood thinner or requiring placement of a new graft. If you experience swelling, pain or numbness of your arm, you may have a problem with your graft and should get medical attention. You need to take care of your AV arm, avoiding heavy use or pressure for as long as you will use the fistula or graft for dialysis. Otherwise, it should function quite well, unless you experience a blood clot. Staying healthy is important too because an infection can occur if you have a problem with your immune system, or if you have a systemic infection, such as sepsis. A venous catheter is a tube that is inserted into one of the large veins in the neck or in the groin. One end of the catheter remains in the vein, and the other end of the catheter remains outside the body. It does not form a bridge between an artery and a vein. The outside end of your catheter has multiple ports, one of which is used to draw blood into a dialysis machine, while the other is used to deliver blood from the machine back into your vein. A venous catheter is used for the short term, such as before your AV graft or an AV fistula is ready for use, or if you need urgent dialysis for a few weeks or months. It can be used right away and placement does require a surgical procedure. The venous catheter stays in place for repeat use instead of being inserted each time you need dialysis. You need to take special care of a venous catheter, making sure that it stays clean and secure to prevent it from malfunctioning, falling out, or becoming infected. If you have kidney failure, you need close medical care. Whether or not you are a candidate for or considering a kidney transplant, dialysis is an important part of your medical care. Learning as much as you can about your kidneys and how they work, as well as how to care for your vascular access, can help you as you navigate the complex a lifesaving process of dialysis. Tomori K, Okada H. Home Hemodialysis: Benefits, Risks, and Barriers. Contrib Nephrol. 2018;196:178-183. doi: 10.1159/000485719. Epub 2018 Jul 24.